Maine summer places in the heart of winter. 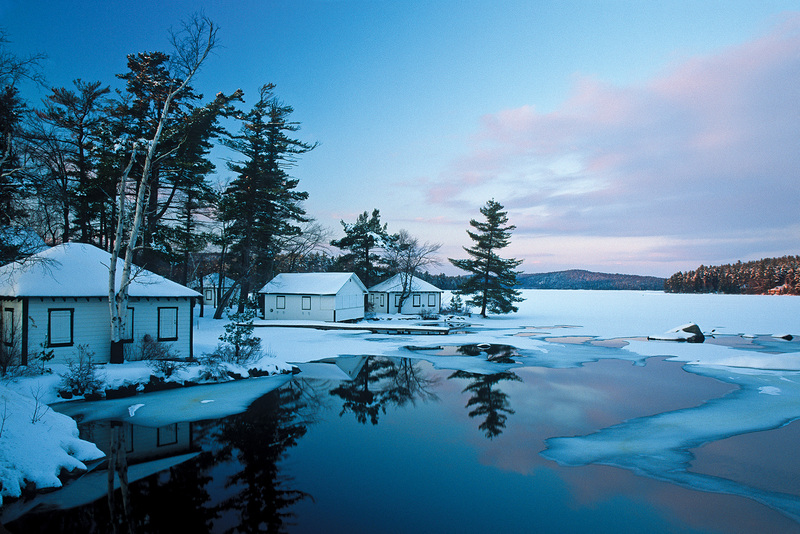 Closed-up cottages on Long Pond, in Belgrade Lakes. HERE IN MAINE, we like to say we get our towns back after the tourists and summer people disappear. We can find a parking space downtown without having to drive around the block. We can get a table at our favorite restaurant (if it isn’t closed for the season), and we don’t even need a reservation. We can let our dogs run free on the beach, and not a single cottage owner will complain. 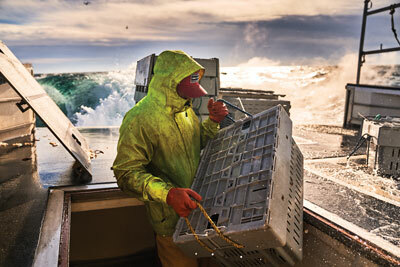 York's Cape Neddick Lobster Pound. But some places don’t belong to anyone this time of year. I’m talking about the lakeside camps, their windows boarded up like eyes shut to a world they’d rather not see. Or the rambling beachfront cottages, whole neighborhoods of them, shades drawn and front steps awash in drifting snow. No snowmen in that snow, no sled tracks either. Not even footprints — at least none made by humans. 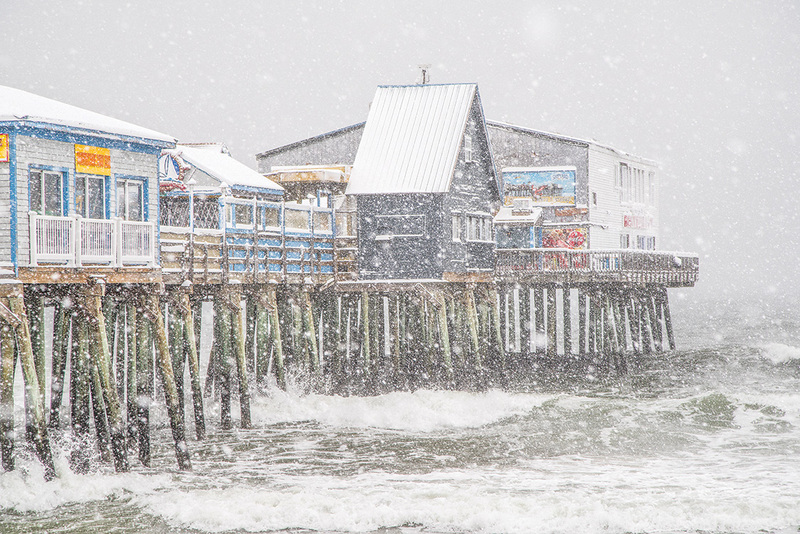 The pier at Old Orchard Beach. Winter in Maine always arrives in the fall. Nevertheless, year after year, we act surprised when it comes: It’s early, isn’t it? (It is not.) Weren’t we just paddling on the lake a few weekends ago? (We were.) By January, we’ve hunkered down and burrowed in. The cold and snow have settled heavily over the landscape, no sign of letting up. In the slender daylight hours, some of us wonder gloomily (okay, I wonder gloomily) if, this time, winter might never leave. Nowhere is this sense of suspended time more pronounced than a summer place. 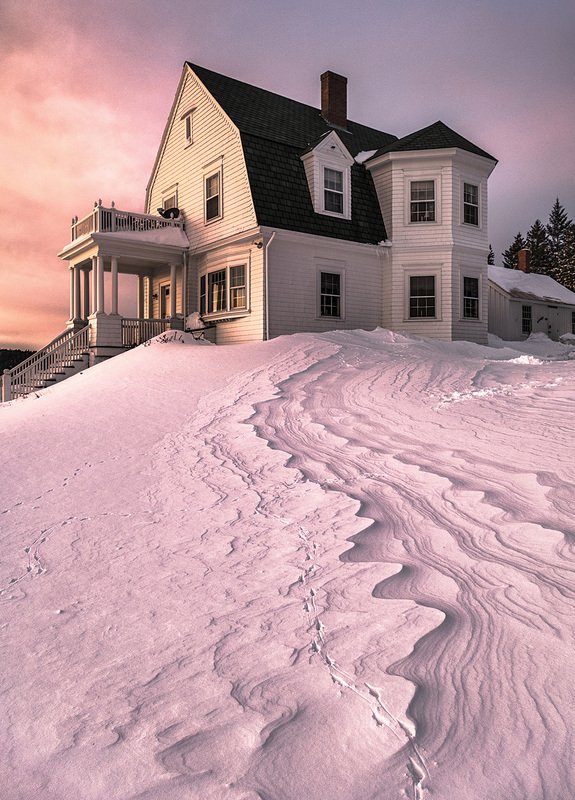 Snowdrifts nestle up against the keeper's house and museum at Port Clyde's Marshall Point Lighthouse. Scenic-cruise booths in Boothbay Harbor. 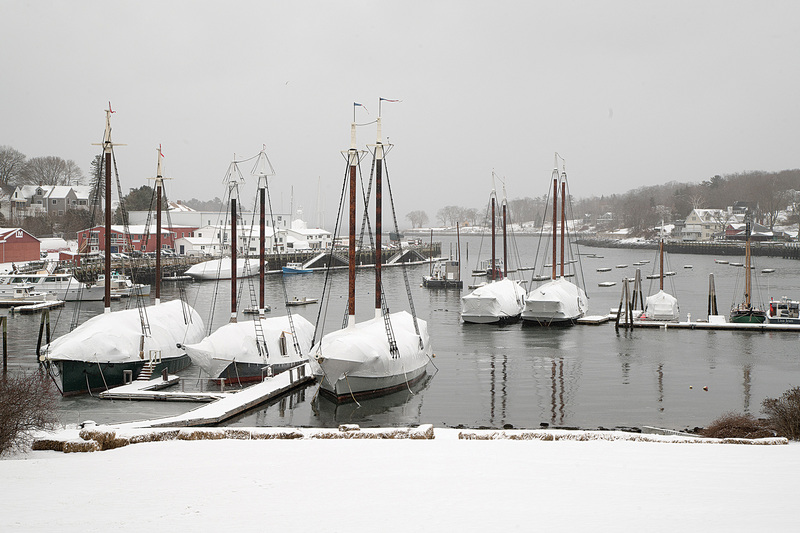 Boats wrapped for winter in Camden Harbor. When I snowshoe around the lakeshore, past those shuttered camps, I think about the decades of families who have summered there. It’s as if, cleared of the distractions of children splashing and motorboats puttering, a path has been opened to the past, or at least what I imagine the past to be. Sometimes my mind wanders in the other direction: what would an archaeologist far in the future make of this deserted colony, half buried in the snow? Would she infer something ceremonial in the arrangement of the fire pits and the beached docks and the way the cabins clutch the shore? Would she be wrong if she did? 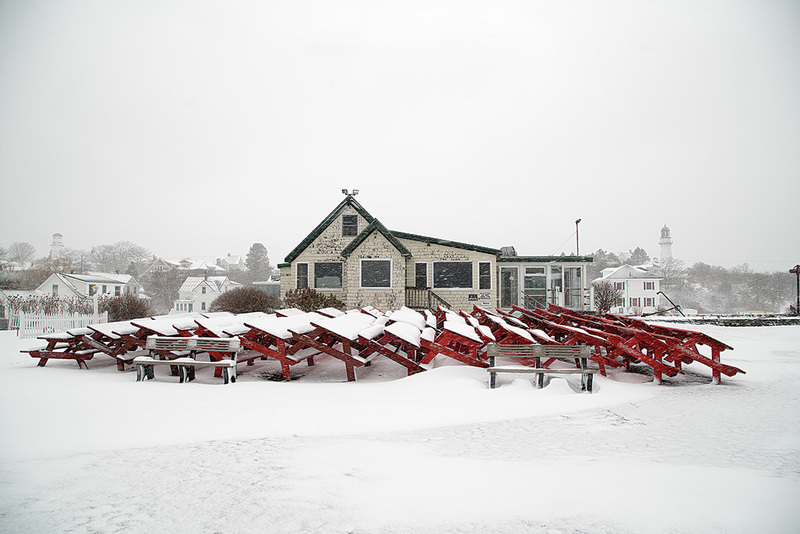 A cascade of picnic tables in front of Cape Elizabeth's Lobster Shack at Two Lights. 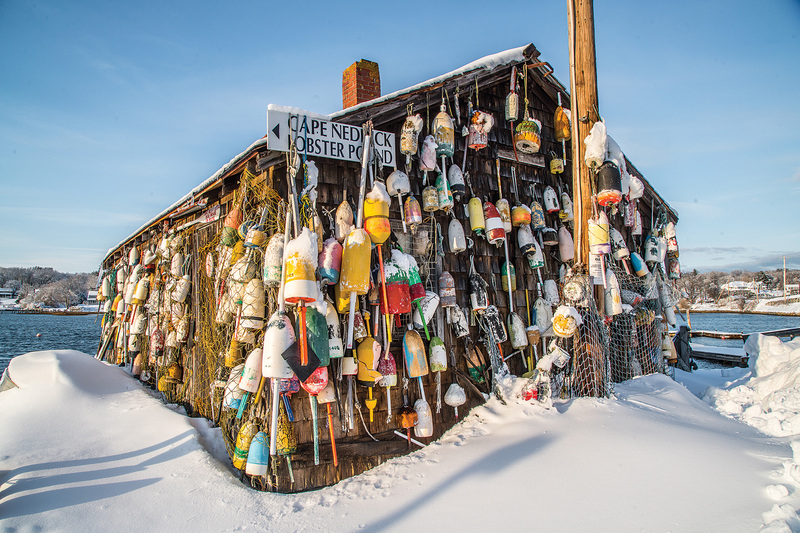 This time of year, Maine is filled with such emptied places, and the eeriest of them are on the coast. Tripping in summer on high doses of sunlight and free-flowing tourist dollars, they now appear post-apocalyptic. Schooners cocooned in shrink-wrap shiver at the docks on gray Camden Harbor. 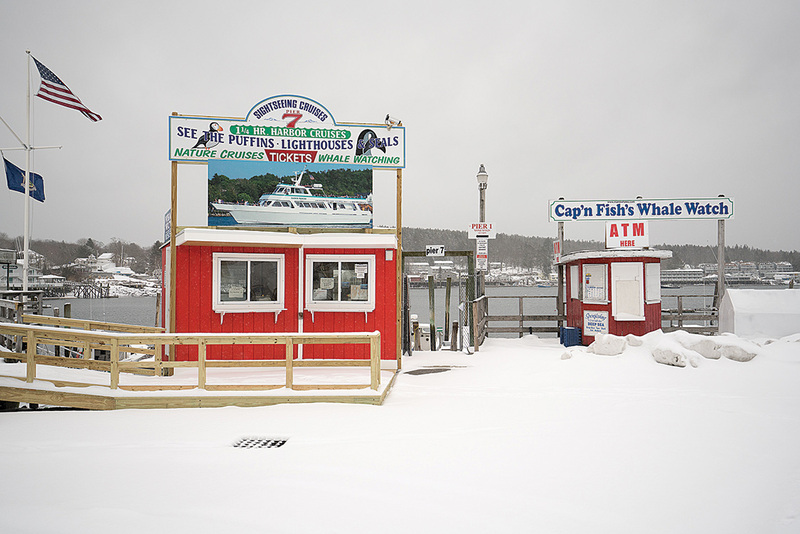 Icy rows of plowed snow block the doorways of tour-boat kiosks in Boothbay Harbor. 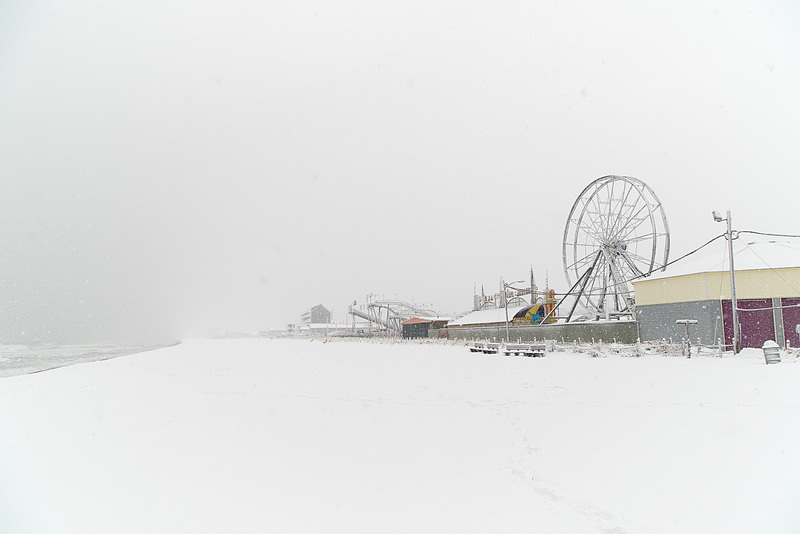 The silvery web of a Ferris wheel stands frozen against a vast white sky over Palace Playland in Old Orchard Beach. The smells of cotton candy and Pier fries and the din of pinball machines and calliope music are memories, replaced by astringent, nose-prickling cold and the claps and sizzles of waves breaking on sand. 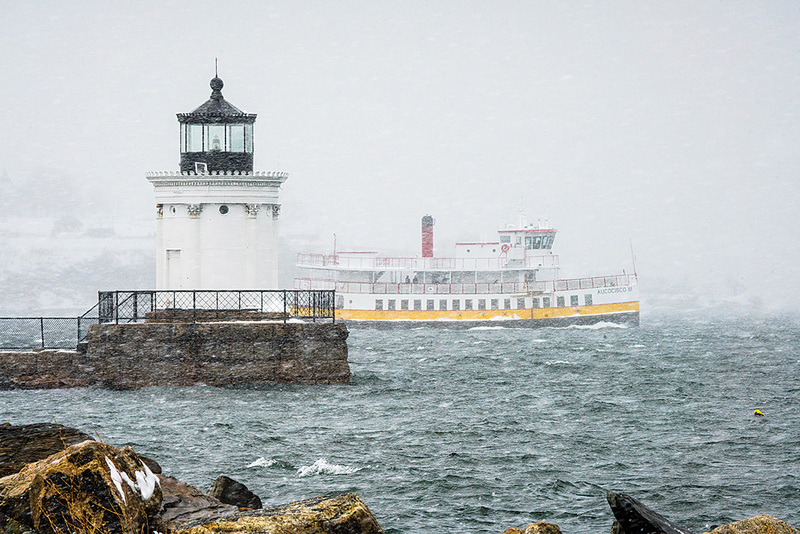 A ferry passing the Portland Breakwater Light, or Bug Light, in South Portland. These places are ghostly, but they are not ghosts. They haven’t been abandoned like the crumbling resorts of the Catskills, where vandals have dumped patio chairs into algae-coated swimming pools and tagged walls with spray paint. No, these places have been vacated with care. Intent on keeping out weather and critters, someone spent days sliding boards over each and every one of those cabin windows. Someone — a lot of someones — painstakingly snow-proofed those windjammers, smoothing that wrap around a boat and blasting it with heat to seal it in place. Someone battened down that Ferris wheel against a season of nor’easters, removing each of its 16 seats and hauling them into storage. There is promise in these desertions — a promise to return — and faith that winter will end, as winters always do. The Palace Playland amusement park at Old Orchard Beach.  Find the feature “Summer in Winter” in print in the January 2018 issue of Down East. 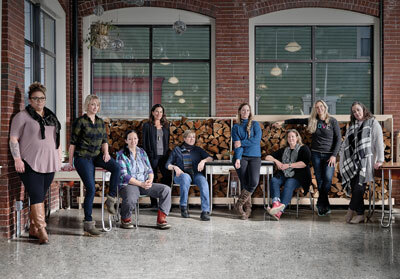 Beautiful article and pictures. Maine in winter is stunning.